Modern and stylish, this Safavieh Courtyard area rug is a quality accent piece. Great quality is assured with this indoor/outdoor piece made out of plush synthetic material. The machine-made construction of this area rug is both modern and comfortable. This geometric patterned blue rug makes a bold statement in your hallway, dining room, or even living room. Place this contemporary Safavieh Courtyard area rug in your home for a piece that makes a statement. Great quality is assured with this indoor/outdoor piece made out of plush synthetic material. Since it is machine-made, you can trust the quality on this rug. Keep things classy, yet high-quality with this geometric patterned blue rug. 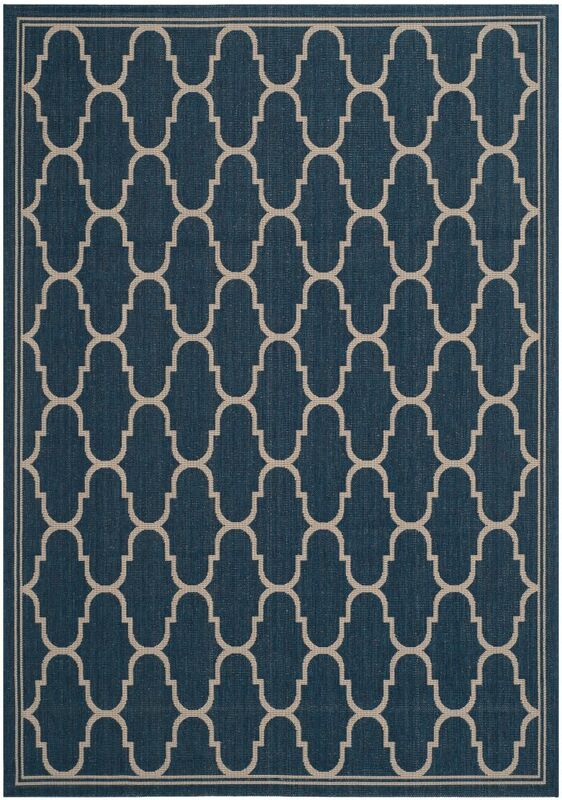 Courtyard Blue 5 ft. 3-inch x 7 ft. 7-inch Indoor/Outdoor Rectangular Area Rug - CY6016-268-5 Modern and stylish, this Safavieh Courtyard area rug is a quality accent piece. Great quality is assured with this indoor/outdoor piece made out of plush synthetic material. The machine-made construction of this area rug is both modern and comfortable. This geometric patterned blue rug makes a bold statement in your hallway, dining room, or even living room.